Former Scottish National Party MP Angus Robertson has launched a polling and research organisation called 'Progress Scotland', which will examine political opinion in the country following the Scottish independence and Brexit referenda. 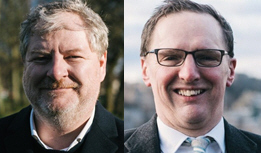 Robertson, the former SNP Deputy Leader and Westminster SNP Group Leader, heads up the new company, where he is joined by Mark Diffley, who previously held leadership roles at Ipsos MORI and Audit Scotland. Diffley was also the lead pollster for the UK Government in the run-up to the 2014 independence referendum and he now runs his own consultancy. Robertson says the company will research the opinion of people in Scotland and provide insight and analysis on what is needed to persuade people on the case for Scotland to make 'progress'. Progress Scotland, which will be funded through public subscriptions and donations, will provide opinion polling, focus group and other research, with analysis released to subscribers. Commenting on the launch, Diffley said: 'I am going to conduct the polls and research for 'Progress Scotland' and I am very excited to see what we will find. With so much going on with Brexit and the debate about Scotland's future, now is the right time to ask people about their opinions, how they are changing and why. It makes sense to try and understand people's hopes and concerns especially at this time of change'. Web sites: www.progressscotland.org and www.markdiffley.co.uk .